The french organization has a board of ten members. General meetings are held every year with all members. Taramana France has no employees. In partnership with the SCD (Service de Coopération au Développement), an NGO approved by the french Ministry of Foreign Affairs, Taramana welcomes one or two International Solidarity Volunteers (VSI). 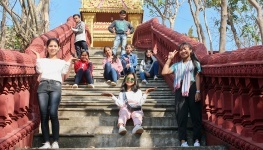 The funds raised by the non-profit through sponsorship, donations and various events are exclusively used for the various programs in Phnom Penh. In mid-2016, Taramana moved to a new, larger, safer and more functional center. It contains three classrooms, an infirmary, a multi-sports hall, computer room, canteen, laundry area, showers and two rooms for after-school-activities. All employees and volunteers work at the center.